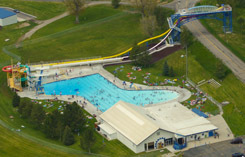 We make a yearly trip to Lava Hot Springs, just southeast of Pocatello, to swim, dive, dance, zipline and just have fun. We try to carpool and/or caravan over and back. We can stay at a B&B, rent a house or rent an RV or camping space. This year we will be going August 17 - 19, 2012. If you would like to join us, email or call me ASAP as housing fills up rapidly this time of year. For information on Lava Hot Spring go to: lavahotsprings.com.